1)Standard of the Flanged bell mouth: ISO2531, BS EN545, EN598. Material: Roller Made from High Quality Stainless Steel Tube. Fitted with 4no. rollers to ensure the cable does not rub on the duct edge from any angle. 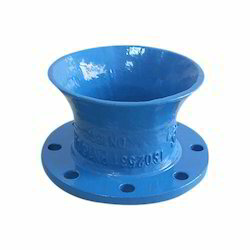 We offer our clients with Bell Mouth Duct sturdily constructed by using suitable manufacturing facilities. Pioneer in the industry, we are engaged in manufacturing an impeccable range of Circular Bell Mouth. Owing to our proficiency in this domain, we are providing our clients an optimum range of Chemical Reactor. With affluent industry practice, our entity has gained huge appreciation in the market by providing Cast Iron Bell Mouth to our respected customers. We offer an ample range of MS Bell Mouth which are obtainable in a variety of proportions and tolerances. Our products can be used in high performing internal combustion engines. We manufacture all Bell Mouth from 200 mm dia to 3000 mm dia. We give first preference to local area that is from Andhra Pradesh (AP). We are affianced in presenting to the industry a top class range of Bell Mouth Custom Shapes Forming. Backed by rich industry experiences; we are highly engaged in offering a premium quality range of Bell Mouth. 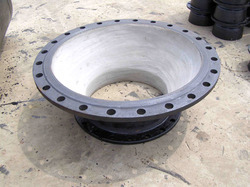 Our Range of Cast Iron Fittings includes Double Socketand Double Flanged Bends, Tees, Tail Pieces, Collars, foot Bends, Reducers, End Caps, Plugs, Bell mouth Pieces, Blank Flanges and Crosses confirming to IS1538. We are engaged in manufacturing a variety of pipe fittings, these Bell Mouths are available at leading industrial prices and are appreciated by the clients nationwide due to thrive quality and excellent performance.